AMD has launched their latest Temash APU platform for “Ultra Low Power” tablets and netbooks. 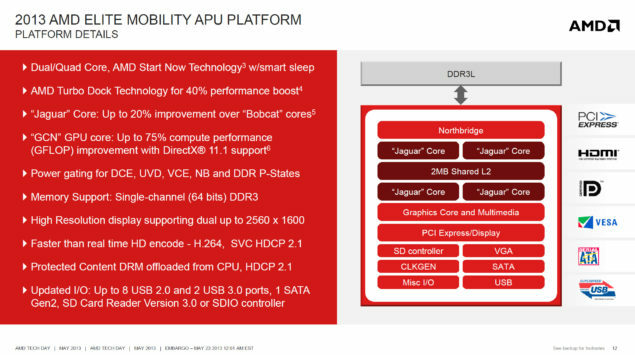 The Temash APU platform from AMD comes with the latest Radeon HD 8000 cores based on the GCN architecture while the CPU features upto four Jaguar modules. The AMD Temash APU platform is built specifically for tablets, convertibles and netbooks with displays under 13 inches. 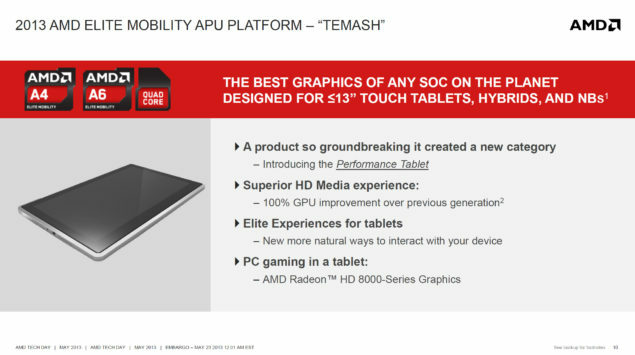 With the Temash platform, AMD has given birth to a new category of technological devices known as the “Performance Tablet”. These so called performance tablets equipped with the latest Temash architecture would feature superior HD Media experience, elite experiences for tablets and gaming on par with PC visuals thanks to the HD 8000 cores. 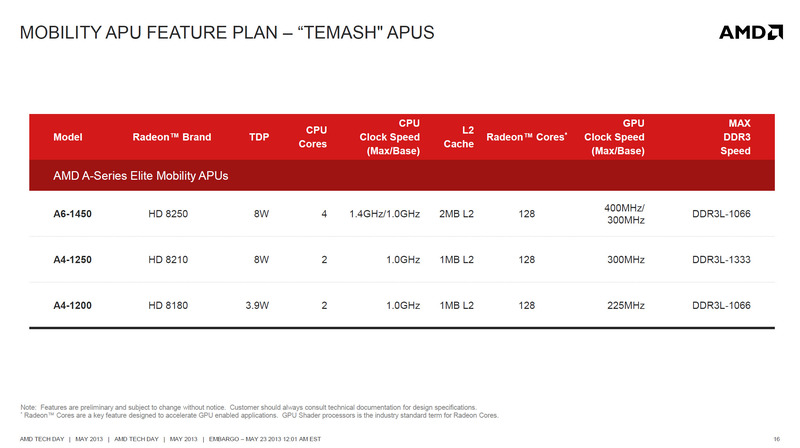 The Temash APU is a complete SOC (System on chip) and has almost everything including chipsets to hubs on the APU die. The Temash SOC comes with 2 – 4 Jaguar modules which share 2 MB of L2 cache. The die also holds the northbridge, GCN based HD 8000 graphics core, PCI Express/Display, SD, VGA, SATA, USB and other misc input and output controllers which is remarkable for a die of that size. With everything onboard a single die, Temash SOC aims to conserve and become an ever more efficient product than AMD’s past generation Brazos APUs. A Temash APU is directly be connected to a memory controller that supports single channel DDR3L memory. 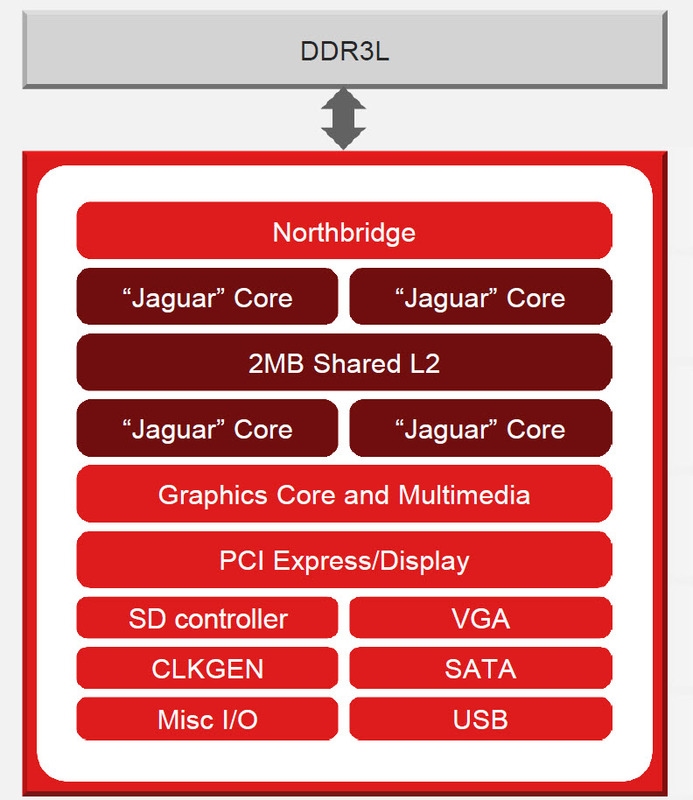 The Jaguar core architecture delivers upto 20% improvement over Bobcat while the GCN based HD 8000 graphics core offers 75% improvement and adds DirectX11.1 support for tablets. Temash powered devices can support resolutions of upto 2560×1600 and support 8 USB 2.0 ports, 2 USB 3.0 ports, 1 SATA II 3GBps and a SD card reader V3.0. 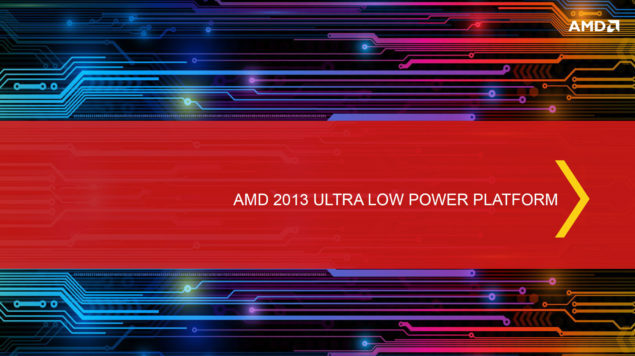 The Temash APU devices come with the AMD start now technology that shuts off the device in idle mode and you can start it on from where you left. 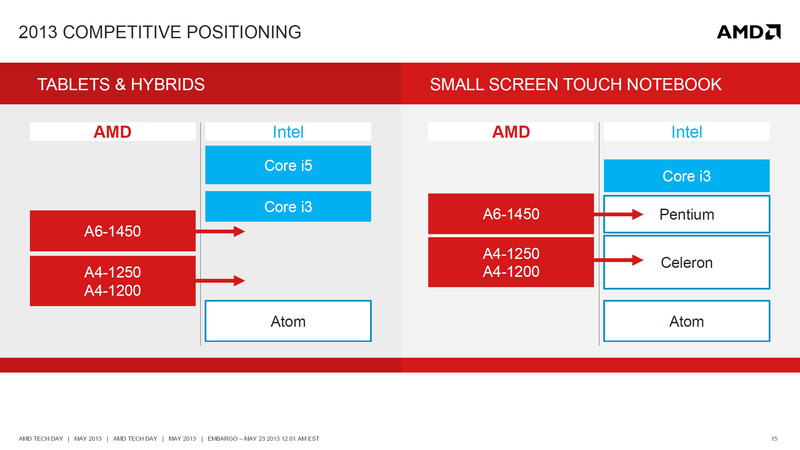 AMD’s Turbo Dock is the most interesting feature which allows upto 40% performance improvement by docking the tablets in a docking device that allows for performance boost. The Turbo dock comes with a fully integrated keyboard that can be used with ease. Compared to past generation platforms, the Temash based A6-1450 in 195% faster in 3DMark 11 and 126% faster in PCMark 7 while being only 8W compared to the 18W E2-1800. Similarly, the A4-1200 is upto 212% better being only 4W compared to the 9W C70 in 3DMark 11. 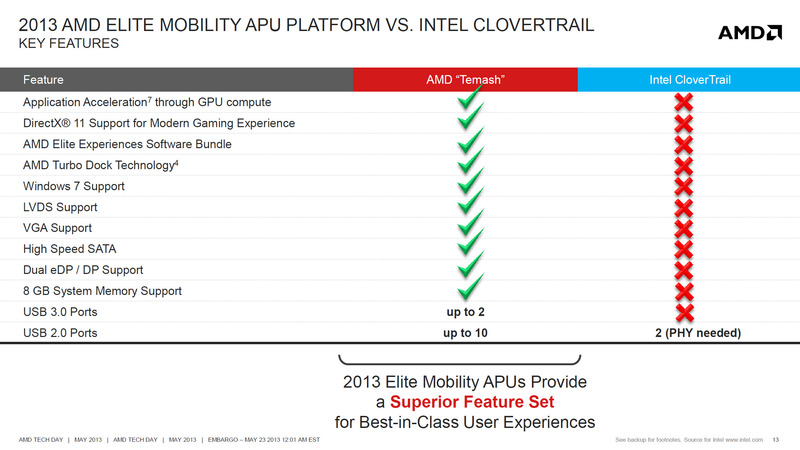 This goes off to show the impressive results of Temash compared to previous generation platforms. AMD’s Temash APU platform is the direct competitor to Intel’s Clovertrail low power SOC. 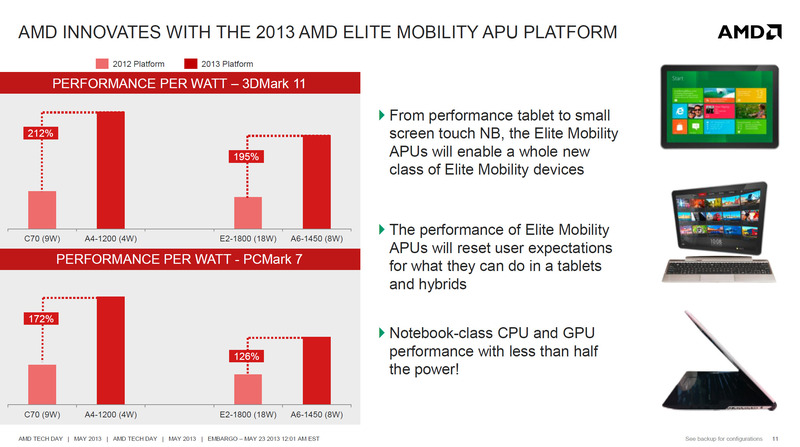 but compared to AMD’s solution it doesn’t offer as many features. From the performance benchmarks provided above, you can note that the Clovertrail Z2760 can not be compared against the AMD’s Temash solutions in gaming results. It barely manages to compete against them not to mention the non-existent OpenCL support. 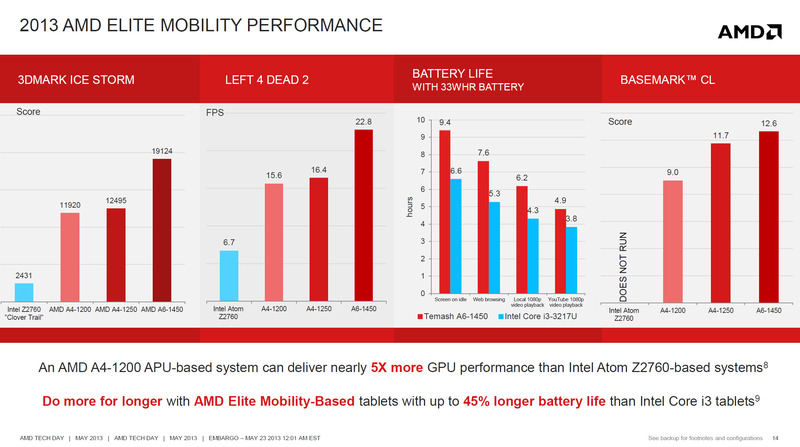 In battery life, the AMD Temash A6-1450 offers 45% more battery than Intel’s Ultra low power Core i3-3217U processor which is impressive.